Simon Petit after Louis Boilly. Petit and Boilly were contemporaries working in Paris throughout the French Revolutionary period. Petit was an accomplished stipple plate engraver and Boilly is best known for his engaging caricatures and satirical work. 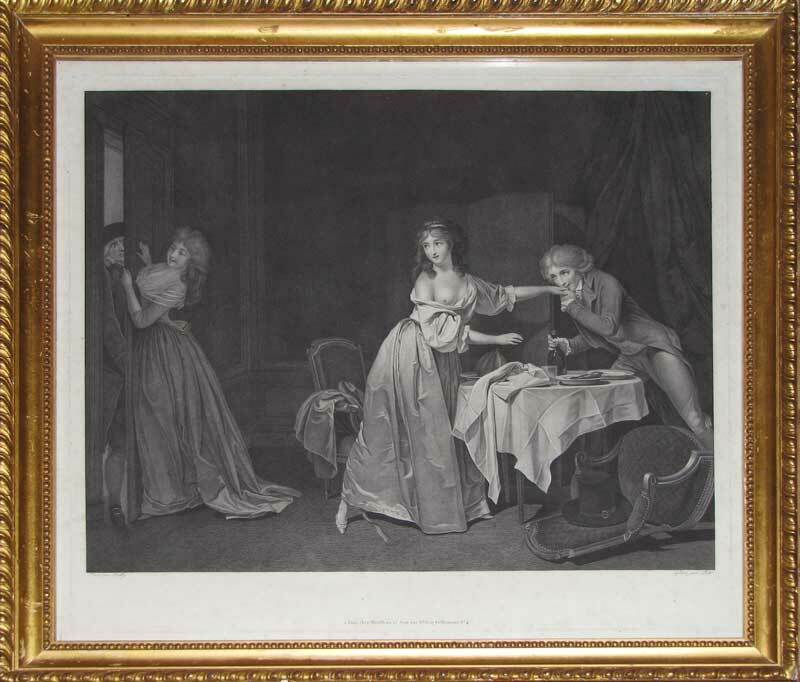 This charming scene is very much in the tradition of Les Estampe Gallant, humorous pieces that chronicle the French aristocracy and their mannerisms. In this genre scene, the mistress of the house is being made love to by a gallant young buck who kisses her hand and admires her décolletage. To avoid further exposure the lady's maid attempts to shut the door and prevent the master of the house from entering and discovering the triste. Stays have been loosened, chairs upturned and the couple have clearly been drinking. A large sausage on the table, artfully placed between the young lover's legs, only adds to the eroticism of the tableau!